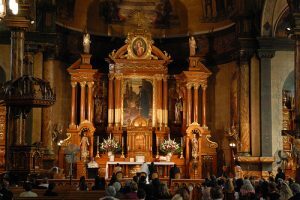 Home › Blog › Traditional Latin Mass: What’s the Draw? At the end of April this year, I attended a workshop at the Canons Regular of St. John Cantius to learn the Extraordinary Form of the Mass, specifically the Low Mass. For the next three months, I practiced the Low Mass with a laser focus, until I could offer it with a modicum of smooth efficiency. Many would simply cringe. They would share with me the common exceptions to the rite that I had heard for years: worshipping in a language no one understands, the priest has his back to the people, the silence, the feeling of disconnectedness. Many had lived through the era when this was the only form of the Mass, and the thought of it brought back horrid memories of childhood for them. However, I had not lived through that era. By the time I attended Mass, all the post-conciliar changes were already in place, for better or worse. I must have had glimpses of that type of worship, with its use of Latin and incense, its awe and reverence. I had seen churches and cathedrals with their magnificent architecture and sculpted statuary, and remembered the sights with awe and wonder. Later, as I returned week after week to the same town church, stripped of any statuary or holy imagery, and the thought hit me: I’ve been cheated out of a full sense of the sacred! The current Catholic blogoshpere is replete with faithful explanations of the use of Latin, the ad orientem posture, in which the priest and people face a common direction, the use of incense, as well as a plethora of other items. An excellent explanation of the ad oriented posture can be found HERE. For more on the sense of the sacred, go HERE. Those objections to the Tridentine Latin Mass may make a lot of sense. They speak of a people seeking to understand God and connect with the Transcendent the best way they humanly can. Yet, the Mass as the Church has given us does not bring itself down to our level, but is meant to lift us beyond our human capabilities and seats us with the Almighty, like a child being lifted up and seated on an high-chair at the dinner table. The Traditional Latin Mass is replete with beauty, majesty, mystery. Every moment, every movement, every word uttered and every gesture performed has meaning and purpose. We may not understand those meanings fully, but let us be open to learning. Let us be open to the Transcendent. I invite all those who are devoted to the Traditional Latin Mass to share their experience. What draws you to the TLM? ‹ Yes, We Need Catholic Fiction!